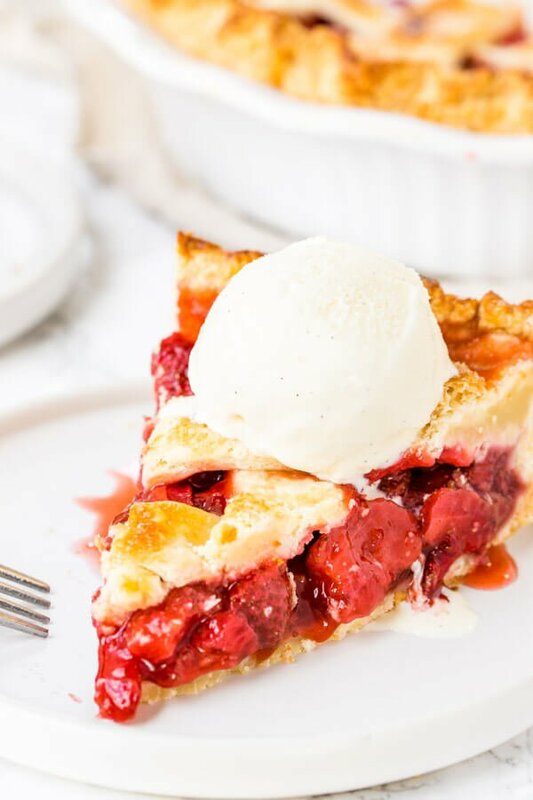 This homemade strawberry pie is an old-fashioned favorite. 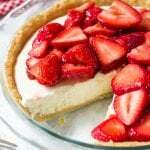 Sweet, juicy strawberries, flaky pastry and a scoop of vanilla ice cream make this baked strawberry pie the perfect dessert for strawberry season. 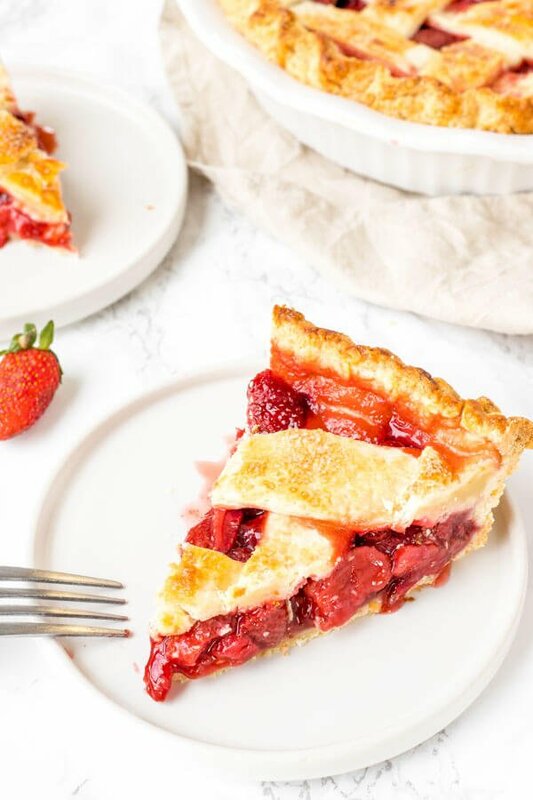 I think pie recipes are one of the best ways to showcase fresh produce – and this strawberry pie is no exception. 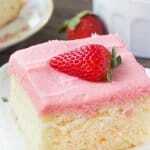 The strawberry filling is juicy and sweet, without being too soupy. Then the delicious strawberries are encased in a flaky pie crust. 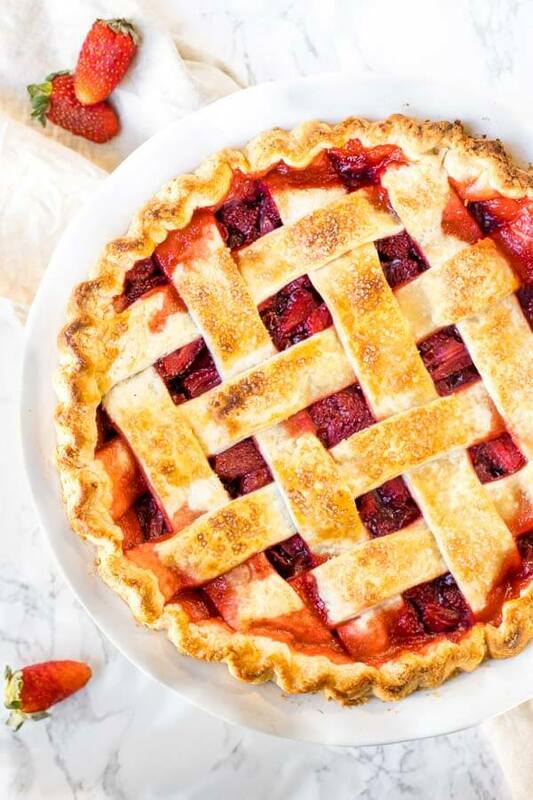 I did a lattice pattern for the top – but you could also use a double crust if that’s more your style. With some strawberry pie recipes, you bake the crust first (aka blind baking). Then the strawberry filling is made on the stove top and poured into the pie crust. The filling usually uses gelatin to set. But I wanted a strawberry pie recipe that’s a little more traditional. So this pie is baked and uses a more traditional pie filling type of recipe. I like to use a combination of white sugar and brown sugar for more flavor, then the cinnamon adds a hint of coziness. 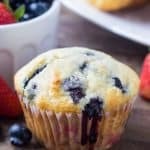 The lemon juice actually helps to bring out the sweetness and flavor of the berries and balances out the flavor perfectly. You’ll gently stir the ingredients together so the strawberries are evenly coated. The mixture will start to get juicy as the sugars bring out the juice of the berries. An overly juicy pie filling leads to a soggy pie crust – which no one wants. There are typically 3 ways to thicken pie filling – either tapioca, flour or cornstarch. Tapioca works well, but I typically don’t have it in my kitchen. Cornstarch is a much better thickening agent than flour, and I’m much more likely to already have it in the cupboard than tapioca – so it’s the perfect option. It thickens the pie nicely so your crust stays flaky and the filling is juicy without being soupy. I’ve included my favorite pie crust recipe below – but feel free to use your favorite pie crust recipe. The recipe below uses both shortening and butter. Shortening makes the pie crust flaky and is a little easier to work with, then the butter adds tons of flavor. You could also use storebought pie dough (not the prebaked pie crusts, but the pie dough that comes in the refrigerator section). You’ll need a recipe for a double crust. You can either make a lattice pie (like I did) or a double crust where the top has a second sheet of pie dough. If using a double crust, make sure to add a few slits with a sharp knife in the top crust to let the steam out. Chill the pie dough for at least 3 hours (or up to 5 days) before rolling it out. Use fresh strawberries. Frozen berries don’t work because they add too much liquid into the pie filling from all the little ice crystals. When spooning the pie filling into the pie crust, use a slotted spoon. Do not add the liquid from the bottom of the bowl into the pie crust – otherwise the pie will be too soupy. An egg wash on the top of the pie makes it golden brown and a little shiny. Place the pie plate on top of a baking sheet, then place the entire thing in the oven to bake the pie. This way if the strawberries bubble over, you won’t get burnt berry juice on the bottom of your oven. After baking the pie for 20-30 minutes, tent a piece of aluminum foil over top of the pie. This stops the pie crust from burning. Cool the pie for at least 3 hours before slicing and serving. This allows the juices to thicken so your pie isn’t one big mess. Using a pastry blender (or 2 forks and your fingers), cut the butter into the flour until it's in small pieces. Then cut the shortening into the flour mixture until both the butter and shortening are in small pea-sized pieces. It won't look like dough yet. Using a rubber spatula or wooden spoon, gently fold in the ice water 1 tablespoon at a time. Only add enough water so that the flour is almost incorporated - you don't want the dough to be sticky. Form the dough into a ball to incorporate any excess flour at the bottom of the bowl. Add the sliced strawberries, cornstarch, white sugar, brown sugar, cinnamon, lemon juice and salt to a large bowl. Gently stir the mixture until the strawberries are evenly coated with cornstarch and sugar. Remove 1 disk of dough from the fridge. On a well-floured surface using a well floured rolling pin, roll it our to form a circle about 12 inches in diameter. Roll gently, starting from the middle of the disc. (If the dough seems too cold - let it warm up for 10 minutes). Carefully transfer the pie dough to a glass or ceramic pie plate. I typically do this by rolling the pie dough over my rolling pin then unrolling it over the pie plate. 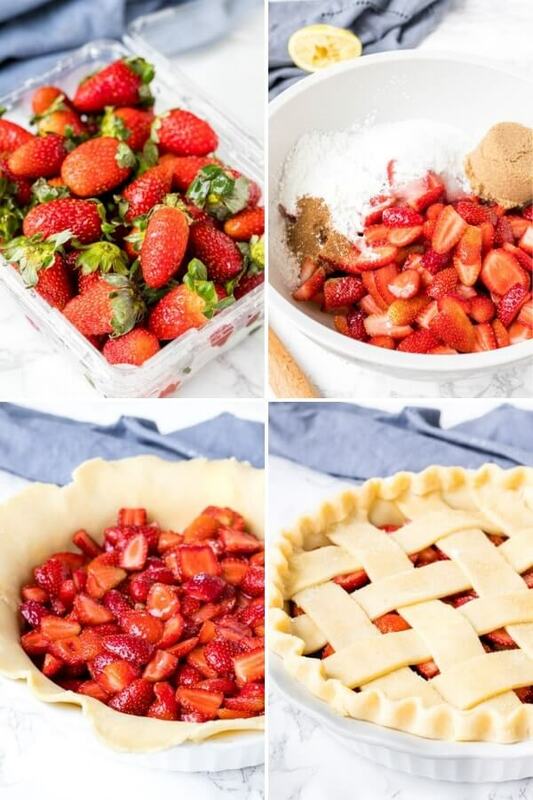 Spoon the strawberry filling into the pie crust. Do not add the juice from the bottom of the bowl - otherwise, your pie will be soupy. Place the pie in the fridge as you roll out the second pie disc. On a well-floured surface using a well floured rolling pin, roll out the second disc of dough until forms a circle about 12 inches in diameter. Using a sharp knife or pizza cutter, cut the dough into strips about 1/2 - 3/4 inches wide. Arrange 4-5 strips vertically on top of the pie. Then weave 4-5 strips horizontally through the vertical strips, alternating between going over and under. 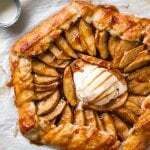 Cut off any excess pastry dough around the edges, then fold the edges over and crimp them using your fingers or a fork. In a small bowl, whisk the egg. Brush the top of the pie with egg wash (you'll have some leftover), and sprinkle with coarse sugar. Bake the pie in the preheated oven for 20 minutes at 400F, then turn the oven down to 375F and continue baking for 40 minutes. After 20 minutes, I usually cover my pie with aluminum foil (or pie guards) to prevent the crust from burning. Cool the pie at room temperature for at least 3 hours before serving to allow the juices to thicken. *Feel free to use storebought pie dough (not the pre-baked crusts), or your favorite pie dough recipe. You'll need a double crust pie dough recipe. **Pie dough can be refrigerated for up to 5 days. Make ahead tips: Pie is a great dessert to make the day before. After it's fully cooled, lightly wrap the top in foil and refrigerate. Store leftovers covered in the fridge.